Watts & Co. was a radical publishing house founded in 1864 in London by Charles Watts senior. His son Charles Albert Watts was a secularist literary publisher and founder of the New Humanist magazine and Rationalist Press Association. 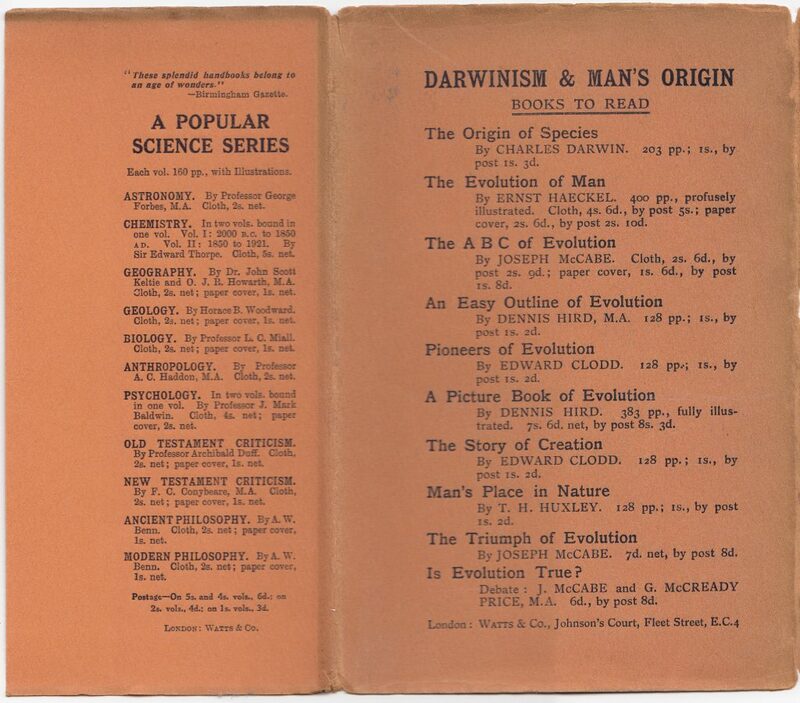 He ran the press after 1883 and began to publish cheap editions of writers such as Darwin, Huxley, and Mill. These efforts evolved into the Forum Series and the Thinker’s Library (published between 1929 and 1951 with 140 titles). Both advocated for the rationalist worldview, with science at the core of understanding humanity and the world. The Forum Series was Watts’ series of innovative and often radical texts, most of them relatively short in length, addressing key debates of the day. The first titles were issued in 1926 and the last and 21st title in 1937. The idea of the series was allegedly that of Rationalist writer Joseph Martin McCabe. McCabe was the most prolific author in the famed soft-bound tiny-format Little Blue Books series (published by Haldeman-Julius), and proposed a similar series, to be called the Pocket Series, be published in the UK. Watts put the series together, renaming it in the process, and began publishing titles in 1926 (source). 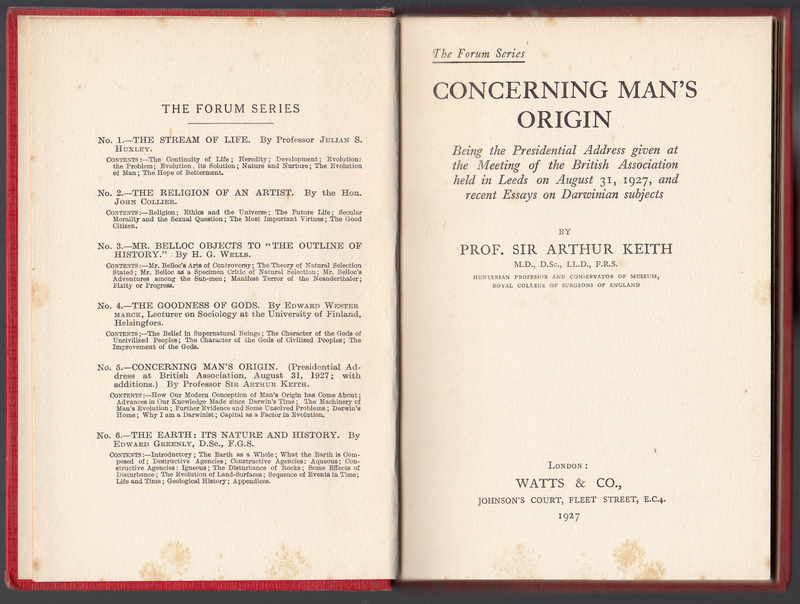 A subsequent related series, the Thinker’s Forum Series, appeared in paperback in 1940 and lasted until 1949. 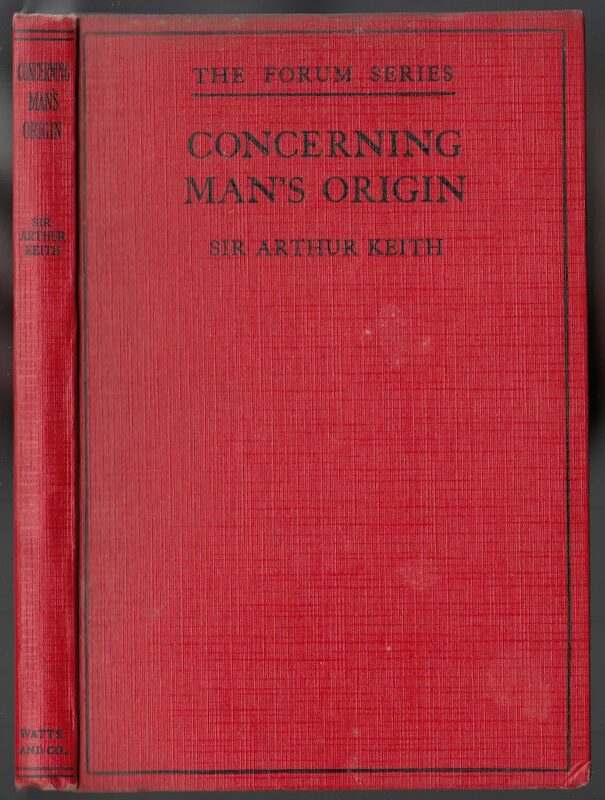 Sir Arthur Keith’s Concerning Man’s Origin was first published in 1926 as #5 in the series. Jackets were common to the series and did not seem to vary in design or color over time. The series name is on the front of the jacket in a forum-themed design. Besides the book’s title and author, sub-sections of the book are noted on the jacket front. The price is also on the front of the jacket, in this case, 1 shilling. 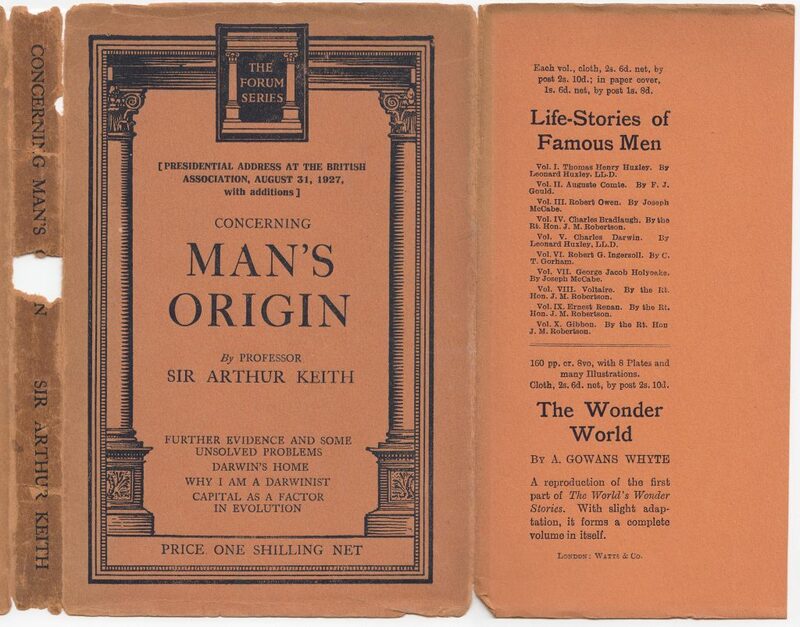 The front jacket flap lists the Life-Stories of Famous Men series and The Wonder World by A. Gowans Whyte. The rear of the book lists a series of titles published by Watts on Darwinism. Another Watts series, A Popular Science Series, is advertised on the rear jacket flap. 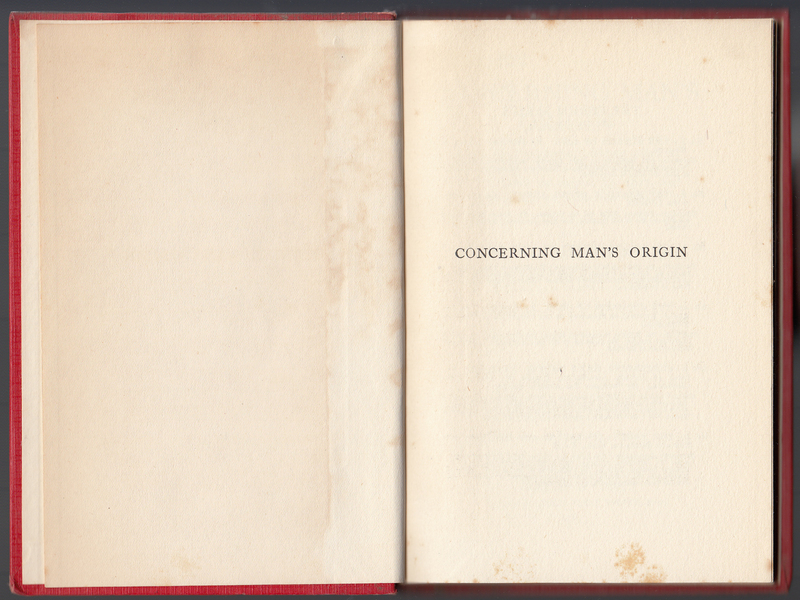 Plasticized cloth bindings in red were the norm for the hardcover titles in the series throughout its run. The series name is noted on the front cover of the book. A list of the first 6 titles in the series faces the title page. The date (1927) is included under Watts’ imprint. 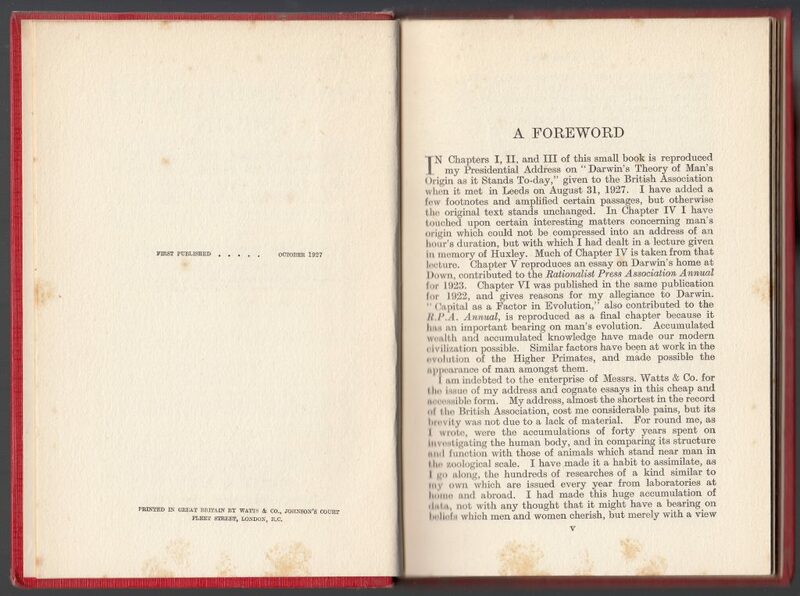 The copyright page includes an indication of “First Published… October 1927.” The printer is Watts & Co.